A flower bouquet made up of mainly yellow roses with red and white flowers added for extra color for sale at the street market in Nice, France. A colorful group of flowers displayed in a beautiful flower bouquet is just one of many throughout the Cours Saleya street market in Nice, France. The Cours Saleya street market is one of the most popular of all the markets in Nice where you will find a variety of different goods, produce, vegetables and a flower bouquet for every occasion. 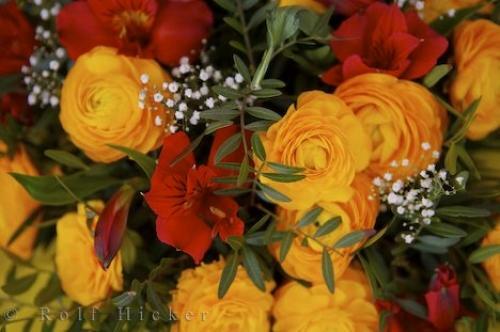 Photo of a colorful flower bouquet on display at the Cours Saleya market in Nice, France in Europe.